How might accurate self-knowledge shape the way we love each other and our witness to a watching world? Over four fortnightly sessions (schedule below), Ian Morgan Cron and Suzanne Stabile will be our conversation partners. We’ll dive deep into their book, The Road Back to You: An Enneagram Journey to Self-Discovery (Downers Grove, IL: InverVarsity Press, 2016). 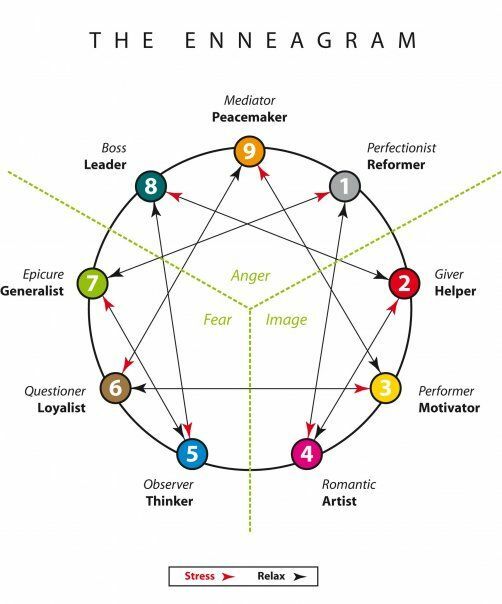 Speaking frankly, I find most personality tests frustrating, even as I can see their purpose, like the Meyer-Briggs/16Personalities and the Gallup Poll’s StrengthsFinder. It may well be my personality type (! ), but I’m suspicious of how they compartmentalise your identity into fragments like introvert vs. extravert, thinking vs. feeling, sensing vs. intuition, and judging vs. perceiving. Personally, I’ve changed a lot since my early days in youth work, later losing my head in the books, and now lecturing in higher education. But what’s largely remained constant is the core motivation driving my decisions, and my strong tendencies, whether healthy and relaxed or stressed and under pressure, to adopt certain patterns of behaviour in dealing with a complex world and confusing people therein. That’s where the beauty of this repackaged ancient wisdom in the Enneagram is apparent. The deeper I’ve looked, and the more conversations with devotees I’ve had, it keeps life together and is the most powerful tool I’ve found to truly understand both myself and my neighbour, thus learning to love as a witness to a relationally dysfunctional wider world. A model for healthy relationships may be one of the greatest gifts the church can give a post-Christian culture. That is, of course, if it’s a gift we already possess. Thus the beauty of Cron and Stabile’s book. They synthesise many of these frameworks into an accessible and engaging read, seeing the non-reducible person at the centre, and placing this informative schema within a Christian theological frame. Each type is considered from childhood to adulthood, at work and play, alone and in relationship, when healthy and unhealthy, in terms of strengths and weaknesses, even mapping a path toward transformation guided by prime examples. To give you a jump start into the 9-types of personalities and core drivers, listen to an interview with them on the Liturgists podcast (page/youtube), check out their web site and original podcast, and see what it looks like relationally through interviews on Ian Morgan Cron’s Typology podcast or by reading Suzanne Stabile’s The Path Between Us (2018). I’ve also enjoyed listening to the band “Sleeping at Last“, with their Atlas Album featuring 9 Enneagram songs (e.g. Type VIII Challenger here) and lyric videos (also here). All of this encouragement aside, we also need to critically assess some questionable ties between the Enneagram and Kabbalistic mysticism/New Age syncretism, such as examined here and here. Studying this book shouldn’t be read as a whole-hearted endorsement of all the authors say and do; rather, it’s recognition that there’s something worthy of further exploration, even if–as Augustine aptly said in City of God–we must “despoil the Egyptians” to repurpose pagan tools for godly ends. All of this will come out over four weeks of dialogue, as you discover your type with its infinite varieties, and learn how to love those different to you. Even so, here’s a snapshot of the nine (ennea in Greek) personalities. The figure (gram) depicts arrows away from a type showing how your personality shifts to take on unhealthy aspects of another core motivator when stressed (as a Type 1, I become sullen like a depressed and jilted Romantic Type 4 when my ideals are endangered), and arrows toward your number indicating the positive energies you draw from another type when feeling secure (when happy I ride my motorbike way too fast, climb mountains, incessantly socialise and seek risky adventure like a Type 7 Enthusiast). There’s a more detailed summary both here and here (click hyperlinks for more), and the following hyperlinks to pictures come from Derek Bruff’s @doodlinginchurch here. Here’s the lowdown. At a glance, which seems most like you, and your core motivation? 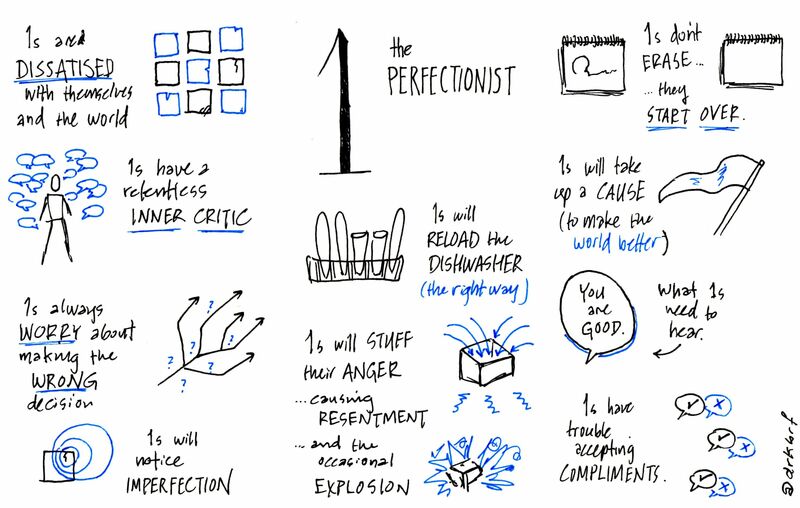 TYPE ONE: THE PERFECTIONIST. Ethical, dedicated and reliable, they are motivated by a desire to live the right way, improve the world, and avoid fault and blame. 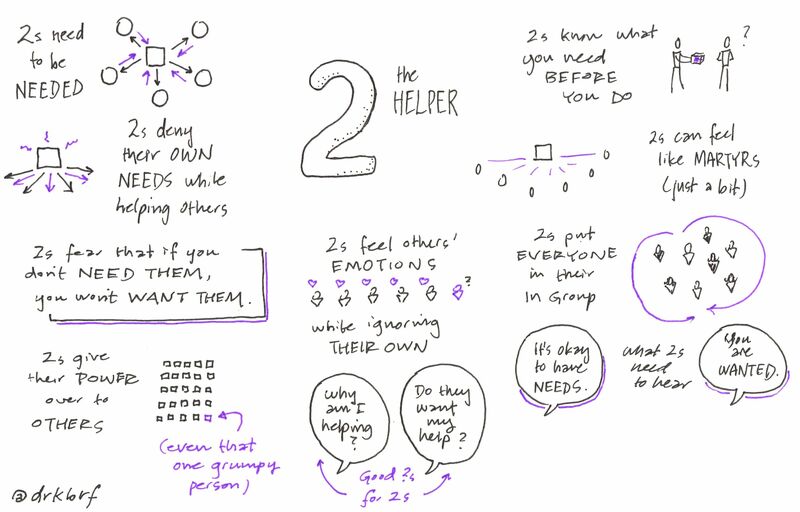 TYPE TWO: THE HELPER. Warm, caring and giving, they are motivated by a need to be loved and needed, and to avoid acknowledging their own needs. 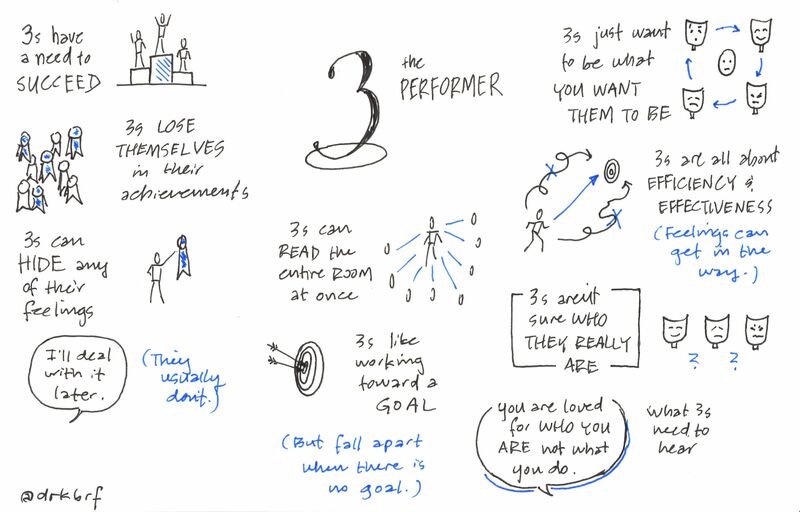 TYPE THREE: THE PERFORMER. Success-oriented, image-conscious and wired for productivity, they are motivated by a need to be (or appear to be) successful and to avoid failure. 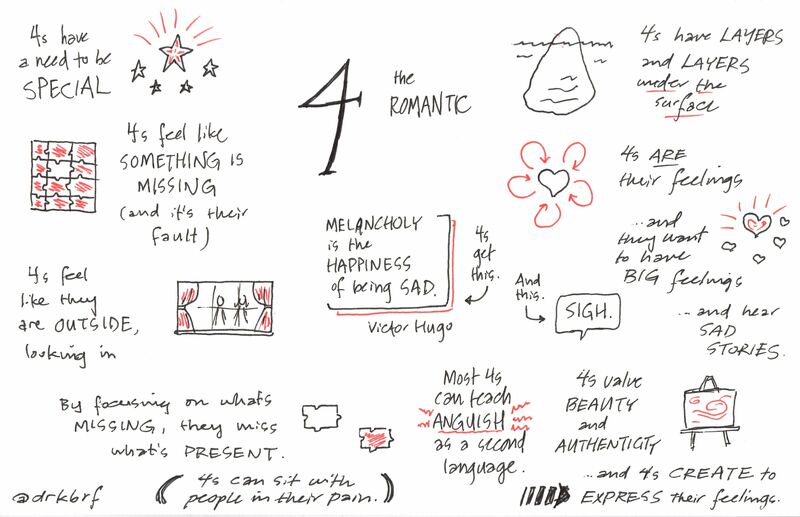 TYPE FOUR: THE ROMANTIC. Creative, sensitive and moody, they are motivated by a need to be understood, experience their over-sized feelings and avoid being ordinary. 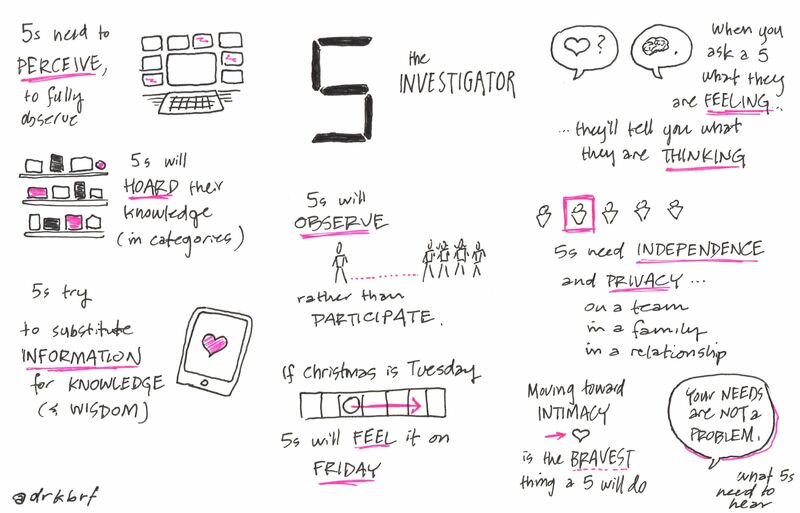 TYPE FIVE: THE INVESTIGATOR. Analytical, detached and private, they are motivated by a need to gain knowledge, conserve energy and avoid relying on others. 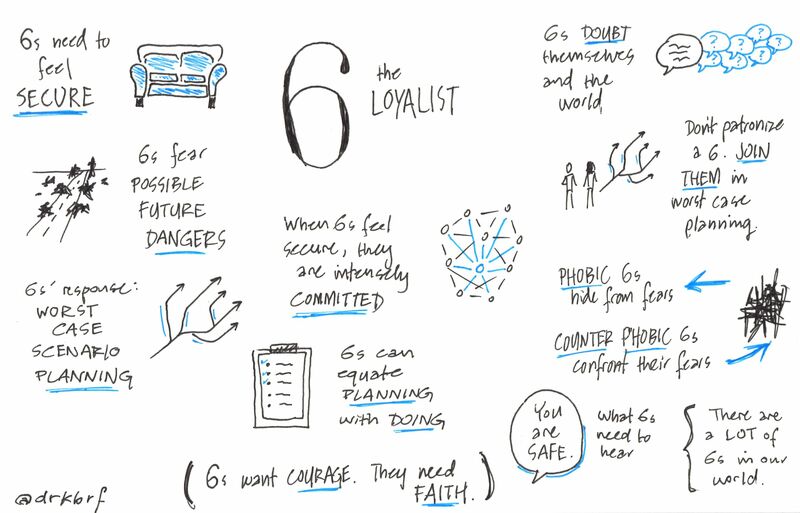 TYPE SIX: THE LOYALIST. Committed, practical and witty, they are worst-case-scenario thinkers who are motivated by fear and the need for security. 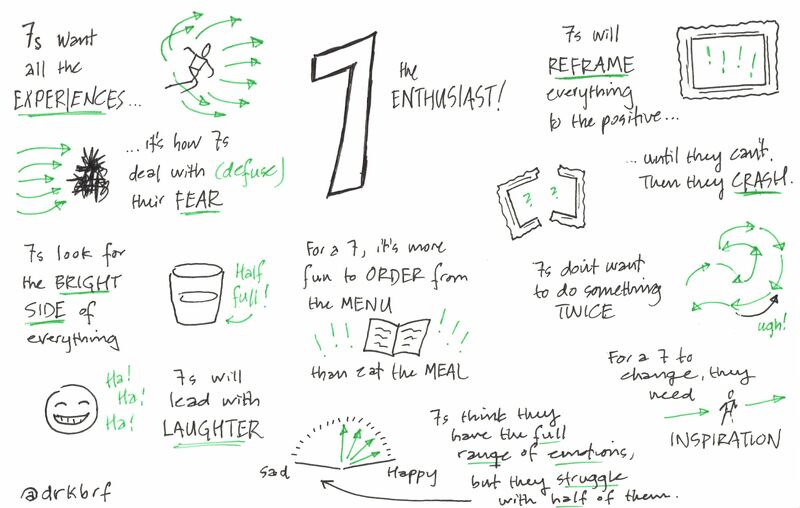 TYPE SEVEN: THE ENTHUSIAST. Fun, spontaneous and adventurous, they are motivated by a need to be happy, to plan stimulating experiences and to avoid pain. TYPE EIGHT: THE CHALLENGER. Commanding, intense and confrontational, they are motivated by a need to be strong and avoid feeling weak or vulnerable. 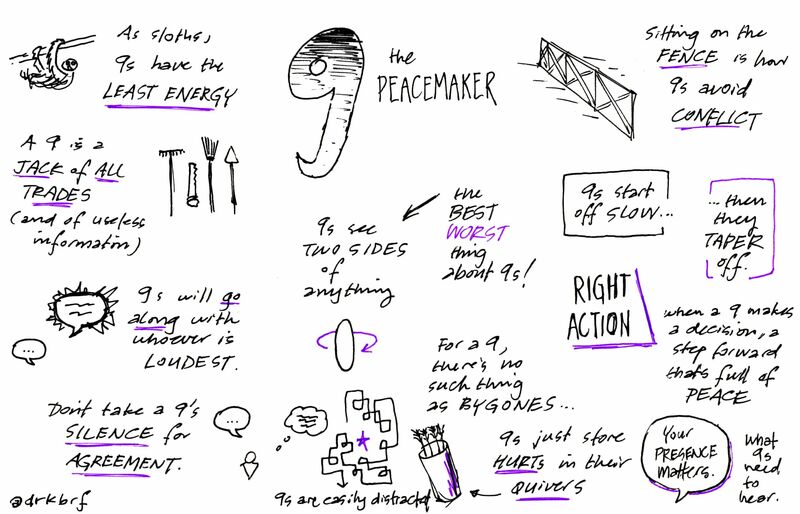 TYPE NINE: THE PEACEMAKER. Pleasant, laid back and accommodating, they are motivated by a need to keep the peace, merge with others and avoid conflict. Over 4 Thursday sessions (March 14 – April 25) at Nik & Dave’s house (152 Tanderra Way, Karana Downs; directions here) we will dialogue with Cron and Stabile’s The Road Back to You [RBY] and each other, teasing apart our Enneagram types and their inter-relationship, en route to discovering how to love each other for the sake of the world. Check out the calendar below for key dates, and pick up your paperback or kindle version of RBY here. 3) Implications: what difference does this make for loving each other and being a communal witness in a divided world? 4) Applications: what does it look like for us to live out of this vision, making God known by the life of our community together? March 1 | Pre-series Open Table dinner, on the theme of “Superheroes“. Who did you always want to be? What’s your superpower? Or your kryptonite? How do these strengths and weaknesses travel together in a purpose-full life lived to “save the world”? At Andrew & Liz Nichols’ house (155 Burbong St. Chapel Hill; call Liz on 0415624982 if lost!). March 14 | RBY 1, pp. 9-62: Ch. 1 “A Curious Theory of Unknown Origin” (9-20), Ch. 2 “Finding Your Type” (21-39), and Ch. 3 “Type Eight: The Challenger” (40-62). March 28 | RBY 2, pp. 63-128: Ch. 4 “Type Nine: The Peacemaker” (63-89), Ch. 5 “Type One: The Perfectionist” (90-109), and Ch. 6 “Type Two: The Helper” (110-128). April 11 | RBY 3, pp. 129-187: Ch. 7 “Type Three: The Performer” (129-147), Ch. 8 “Type Four: The Romantic” (148-166), and Ch. 9 “Type Five: The Investigator” (167-187). April 25 | RBY 4, pp. 188-230: Ch. 10 “Type Six: The Loyalist” (188-204), Ch. 11 “Type Seven: The Enthusiast” (205-225), and Ch. 12 “So Now What? The Beginning of Love” (226-230). May 10 | Open Table dinner, on the theme of “Wisdom of Our Elders“. Who has impacted your life the most as a mentor? We’ll explore stories of ageing, what we’ve learned from those who’ve lived well and also would rather forget from our grumpy forebears. Generally, we’ll trade hard earned wisdom that gave many their grey hairs! Location t.b.a. How might the church’s life of worship when gathered together serve its work in the world when scattered and sent into a post-Christian culture? Our conversation partner is Professor David E. Fitch, missiologist and founding pastor of Life on the Vine Christian Community and Peace of Christ Church, both in Chicago. The book? 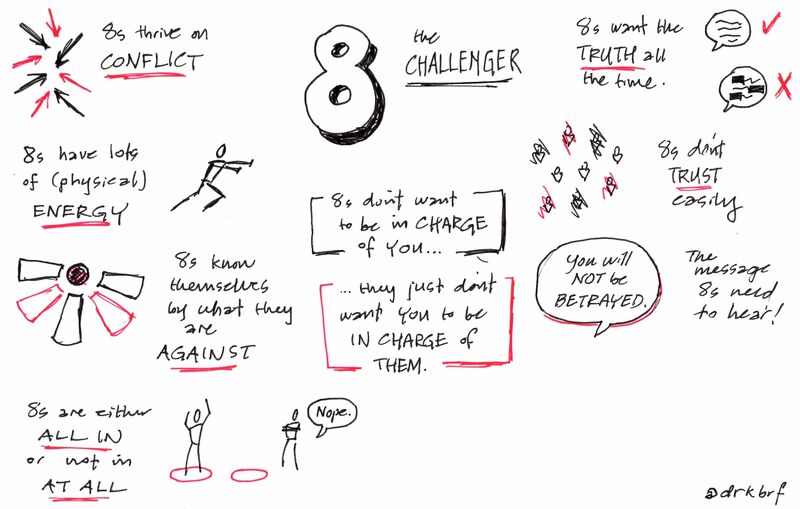 Faithful Presence: Seven Disciplines that Shape the Church for Mission (2016). The title borrows from James Davison Hunter’s landmark 2010 book, To Change the World: The Irony, Tragedy, and Possibility of Christianity in the Late Modern World. As summarised here, Hunter dismantles prevailing political theologies and popular wisdom concerning how the church is to engage and change the world. Most strategies founder on triumphalism (evangelicalism & radical orthodoxy) that tries to take over the culture one individual at a time, or pietistic escapism as a counter-culture on the margins (anabaptists) that largely leaves the culture to rot. Instead, Hunter calls for a different paradigm of Christian engagement with the world, that being “faithful presence”—an ideal of Christian practice that is not only individual but institutional; a model that plays out not only in all relationships but in our work and all spheres of social life. Unfortunately, as critiques here and here demonstrate, Hunter at times caricatured these communities, ignoring what they look like at their best. And more importantly, for our purposes at least, his proposal was largely abstract and theoretical, hinting at a strategy but never mapping out the path. Does this call for cultural persistence constitute a program, a project, or a reworking of the church itself geared up for mission? Hunter leaves us wondering. It puts flesh on much of what we do in Christ’s Pieces. God hosts us in the “close circle” of Christian fellowship (much like Quarry, practicing the disciplines every Sunday, and Open Book, going deeper in formation). We then make space to host God’s faithful presence around the tables of our homes (like Open Table). In turn, this mixed community is formed to recognise and carry/bear God’s transforming presence as our wider post-Christian culture hosts us, whether in their homes, at work, study or play (our mission as church scattered). God’s transcendence and immanence unite in this Spirit-filled community. Mission and incarnation work in synergy, rather than dividing a fellowship down the middle to either serve home base or go it alone on the margins. So, this book is timely for us. Whilst it’s American in origin, the illustrations map easily onto our Aussie context and especially our intentional Christian Community. Studying Faithful Presence and putting these disciplines into practice is a brilliant opportunity to grow together, and see our communal life opened for the peace and transformation of our local community. Over 5 Thursday sessions (March 8 – April 26) at Nik & Dave’s house (152 Tanderra Way, Karana Downs; directions here) we will dialogue with David Fitch and each other, learning how to host God’s faithful presence for the sake of the world. PS – originally we had planned to study Sam & Sara Hargreaves, Whole Life Worship: Empowering Disciples for the Frontline (buy here; accompanying website here with extra resources here) … promo video here. Though we’ve opted instead for Fitch’s Faithful Presence, this book is still excellent for a focus on the nature of worshipping God as arguably the central purpose of humanity (theologically understood). But what is worship? Is it just singing songs? And how does what we do on Sunday as the Church Gathered, relate to our worldly work Monday to Saturday as the Church Scattered? Similar to the focus for this series, our core question was to be: What does it mean to worship God with our whole lives, where Sunday’s liturgy is a springboard to every day’s worshipful service? How would the Creator have us see and steward the gift of Creation? Our conversation partner is the Argentinian, Jorge Mario Bergoglio. You likely know him better as the 266th Sovereign of Vatican City, Pope Francis (or Papa Francesco as Italians fondly call him), who took his name from the nature loving Saint Francis of Assisi. Pope Francis’s 2015 Encyclical, Laudato Si’ (“Praise be to You”) establishes an expansive theological frame of a creational “common good” and “ecological citizenship”, within which our lives and work can be situated. As the subtitle suggests, it’s on “care for our common home”–where humans are entrusted with a unique care-taking role from within nature, rather than dominating fellow creatures for our anthropocentric ends. There has been a world-wide growing sense that unconstrained human activity and over-consumption has damaged God’s very good gift of Earth, becoming in Bill McKibben’s words Eaarth–an irreversibly changed and tough new planet on which we must make our way forward, humbled for having spoiled our home. And yet, living out of a Greek/neo-Platonic legacy, many Christians have ignored the memo. Perhaps worse, in ecologist Lynn White’s classic 1967 essay, “The Historical Roots of Our Ecological Crisis” here, our western reading of the Bible may itself be uniquely to blame for the mess we’re in. We have a tendency to spiritualise the nature and purpose of humanity. You know, where God will burn up all physical things bright and beautiful in the end, taking the “real me”, my disembodied essence, to heaven for eternity … so cut the greeny talk and just get on with preaching and saving sinking souls off our Titanic planet. But is this who we truly are and what we truly believe? This precarious ecological moment may be reawakening an at once more ancient and future-looking reading of the Bible and framing of faith. The National Church Life Survey in Australia’s numerous reports on faith and the environment (here; podcast here) reveal that only 28 percent of Christians believe that “caring for the earth is an essential part of mission”, despite nearly 7 in 10 believing that “nature is sacred”. Only 22 percent disagree with the belief that “plants and animals exist primarily for human use”. (This is a radically different attitude to our Indigenous forebears, in “The Uluru Statement” asserting our integral connection to the land.) Not surprisingly, then, only a quarter of Jesus’ followers in Australia are very active in caring for the environment as part of their responsibility as disciples–roughly the same proportion of Christians who are even aware of Papa Francesco’s illuminating ecological encyclical Laudato Si’. Which is why it’s high time we delve into this gem. Thankfully, changing our habits isn’t rocket science, whether at the civic/political, local community and church, or consumer level! Churches have recycled, planted trees, hosted community gardens, celebrated environmental days or seasons, run children’s activities, worshipped outside in nature, worked on a project in their community and participated in advocacy campaigns for the environment in the last two years, according to NCLS Research. Well, there’s always more to say. You can read my worldview notes on Creation here, or watch a stirring talk by celebrated Brazilian politician and environmental activist Marina Silva, for her work in saving the Amazonian forest here. You could also explore global climate change responses after the Paris accord here, and what this looks like in Oceania here. 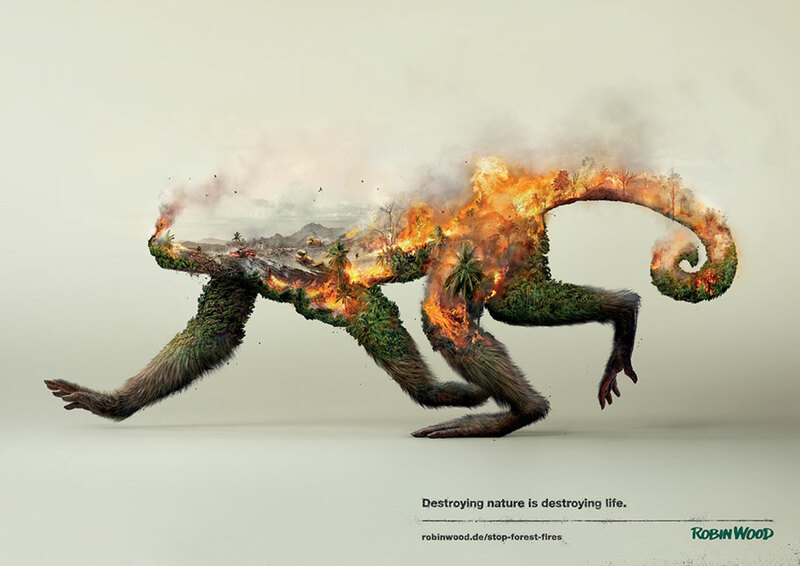 And for an artistic angle, see Robin Wood’s powerful images for the “Destroying Nature Is Destroying Life” campaign here. Of the posting of links, there is no end, and too much reading just makes one tired! So, as the pointy end of this blog, can I simply invite you to join us in conversation as we consider a new way of being creaturely, stumbling imperfectly forward as we work in love for the care of our common home? November 30 | LS 4, pp. 149-180: Ch. 6 “Ecological Education and Spirituality” (§202-246). What practices preserve our witness [& identity] in a post-Christian context? 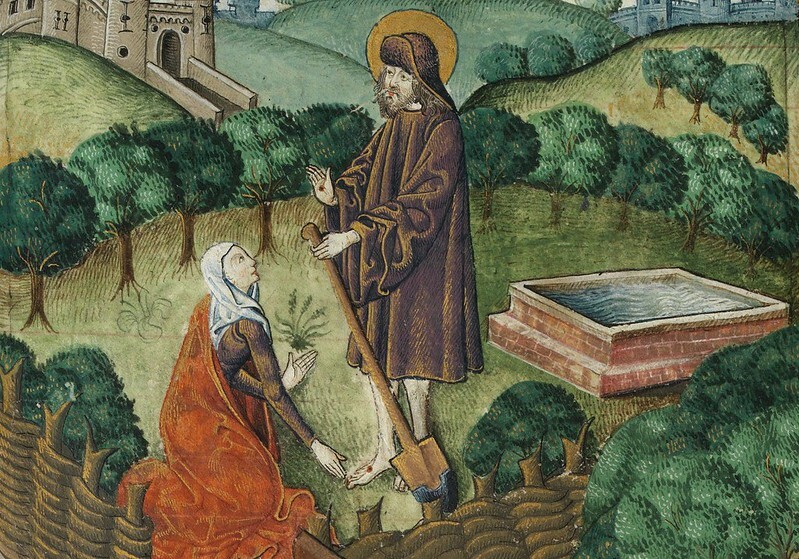 John Stonestreet, from Breakpoint Forum, ran a symposium on the Benedict Option, out of which he compiled over a dozen two-paragraph responses to Dreher’s strategy from leading evangelical thinkers: see here. And for an Aussie reply by the ever-provocative Mike Bird, tweaking this conservative strategy toward more radical love and confident interaction with pushy politicking, see his “Turning the World Upside Down, Down Under“. Okay, the tone of these reviews not-so-subtly communicates that I’ve stopped short of the monastic gates to Mr. Dreher’s Benedictine retreat. I’m not particularly conservative, I detest self-concerned protectionism, and this book is far more right-leaning than most of Open Book’s offerings here-to-fore. So, why bother with this diatribe? Well, two reasons come to mind, one short and sweet, and the other as complex as statistical analysis. For one, it records the seismic shifts shaking the western world, and represents what many people (especially conservatives) find to be a compelling vision for a re-imagined church that has fragmented and lost its way. It challenges our individualistic, consumerist and thin spirituality at its core, and turns our attention to corporate and classic practices that enrich our identity. Given that Christ’s Pieces seeks to grapple with what it means to follow Jesus at this post-Christendom juncture, BenOp is sure to provoke rich discussion, wherever we land on Rod’s particular strategy. It will help us form our own “rule of life” that keeps us in Christ, come-what cultural changes may. So, we’ll drop the protectionism, but redouble our efforts to form a communal spirituality for the sake of the world … one that resonates with Jamie Smith’s embodied and imaginative worship project in You Are What You Love: The Spiritual Power of Habit, and Dallas Willard’s The Spirit of the Disciplines: Understanding How God Changes Lives. Think less Christian conservatism worried about its own survival in a secular state, and more of an outward looking shalom seeking community captured by Mike Frost’s B.E.L.L.S. in his Surprise the World: Five Habits of Highly Missional People (sample here; we’re called to Bless, Eat, Listen, Learn, and be Sent) and David Fitch’s Faithful Presence: Seven Disciplines that Shape the Church for Mission. Our selfie-society needs kingdom citizens who have the virtue and vision necessary to serve the holistic flourishing of all in today’s pluralistic democracy, most especially when hostility is directed to followers of the world’s only saviour. And for two, it asks questions Aussie Christians must answer. How can we sustain faith in an increasingly secular context—one which corrodes contemporary Christianity faster than an iron ark on a salty sea? Since the Australian Bureau of Statistics released its 2016 Census results, many Christian leaders have been in a spin. While 52% of Aussies still loosely identify as Christian, this is a massive slide from the 88% in 1996 and 74% in 1991. This loss neatly parallels the increase in those shunning any religious identification, up from 0.8% in 1996, 12.9% in 1991, and 19% in 2006, to nearly 1/3 of the population (30%) in 2016. If we compare this demographic to Christian denominations (termed ‘religions’ in the census), then NRI (“No Religious Identification”) is the largest “religious” group, overtaking both Catholicism (22.6%) and Anglicanism (13.3%). The situation is markedly more dire if you delve below the superficial ABS data, and dive into the 2016 NCLS “Australian Communities Study” and especially the 2017 McCrindle “Faith and Belief in Australia” study (faithandbelief.org.au; 4 page infographic + 60 page report). Claiming that roughly half of Aussies are Christian is massively overstated, better reflecting low-commitment “moralistic therapeutic deism” (a distant God just wants me to generally be good and feel good) than a community living under the Lordship of Jesus, which based on regular church connection is closer to 15%. As Stephen McAlpine argues, “sexing up the statistics“only makes us slower to accept our minority status, wherein we do better to become a well-formed counter-culture that can prophetically speak truth to power from society’s margins, without claiming historical privilege. The media has seized on these stats, highlighting that this slide away from religion will only accelerate as more-religious older generations shuffle off this mortal coil, and younger less-religious generations take their place, such as Gen Y (those presently 18-34 years old) with 39% distanced from traditional religion. Secularists have renewed calls for the government to “End Australia’s Religious Bias“, damning any public funding and governmental support even for churches contributing to the common good, garnering support through op-eds in leading national newspapers. Whatever your take on these stats, Aussies Christians have some tough questions to answer, for—as the 2017 Morling College Symposium theme suggests—we are “Not In Kansas Anymore“. What is the role of God’s people in an increasingly post-christian West? Are we activist exiles or quaint keepers of an ancient flame? Are we to lean in to culture and insist on our right to act as chaplains to a fading Christendom, or should we withdraw and exercise the ‘Benedict option’? What is a creative and biblical strategy for how the church is to be in a context where God’s people feel increasingly marginalised and overlooked. Question #1. For those promoting engagement with the world, the question is: how can Christians expect to offer their neighbours a different way of thinking and loving if they fully immerse themselves in their neighbours’ ways of speaking and acting? … [and] Question #2. For those promoting a distinct countercultural community, the question is: how will those who live according to a different worldview be able to see the Church’s distinct witness as intelligible and attractive? Which brings us back to the core question driving this series: “What practices preserve our witness [& identity] in a post-Christian context?” Interested? Then come along, whatever your religious conviction or none. Over 5 fortnightly Thursday sessions (July 27 – September 21) at Nik & Dave’s house (152 Tanderra Way, Karana Downs; directions here) we will dialogue with Dreher and each other, learning how to sustain our faith in a secular culture toxic to deep commitment. Check out the calendar below for key dates, and pdf links to carry you through until you get your own copy of the book (purchase asap on Amazon.com). July 27 | BenOp 1, pp. 1-47: Introduction—The Awakening (1-6), Ch. 1 The Great Flood (7-20), & Ch. 2 The Roots of the Crisis (21-47). August 10 | BenOp 2, pp. 48-99: Ch. 3 A Rule for Living (48-77) & Ch. 4 A New Kind of Christian Politics (78-99). August 24 | BenOp 3, pp. 100-143: Ch. 5 A Church for All Seasons (100-121) & Ch. 6 The Idea of a Christian Village (122-143). September 7 | BenOp 4, pp. 144-194: Ch. 7 Education as Christian Formation (144-175) & Ch. 8 Preparing for Hard Labor (176-194). September 21 | BenOp 5, pp. 195-246: Ch. 9 Eros and the New Christian Counterculture, Ch. 10 Man and the Machine (218-236), & Conclusion—The Benedict Decision (237-244). 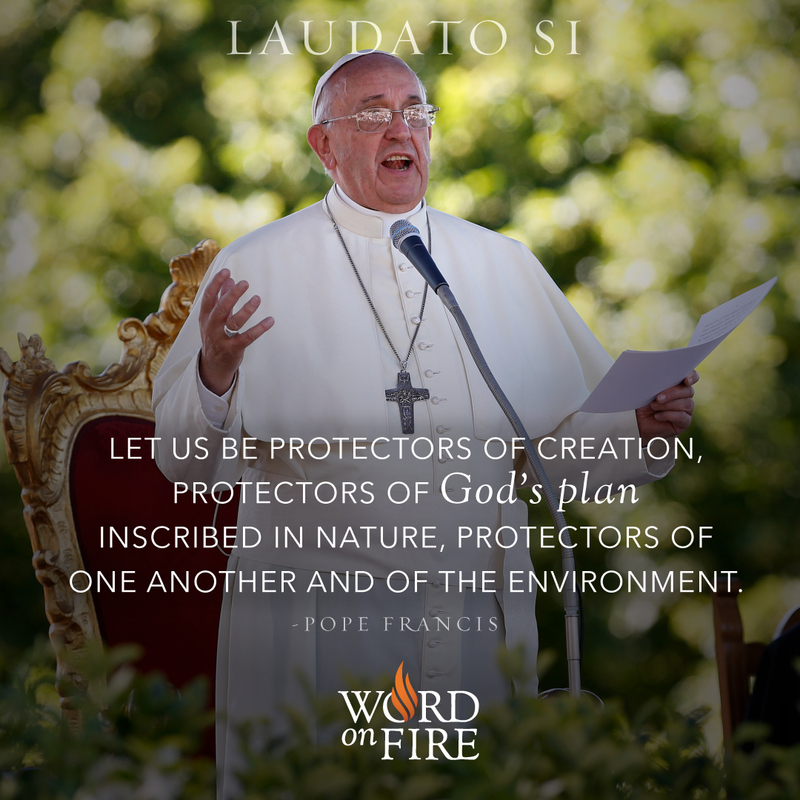 October 19 | Restart for the final series of 2017, exploring Pope Francis’s Laudato Si’ for what it means to care for our common creational home (also drawing on “The Uluru Statement” for an Indigenous perspective of our connection to the land).